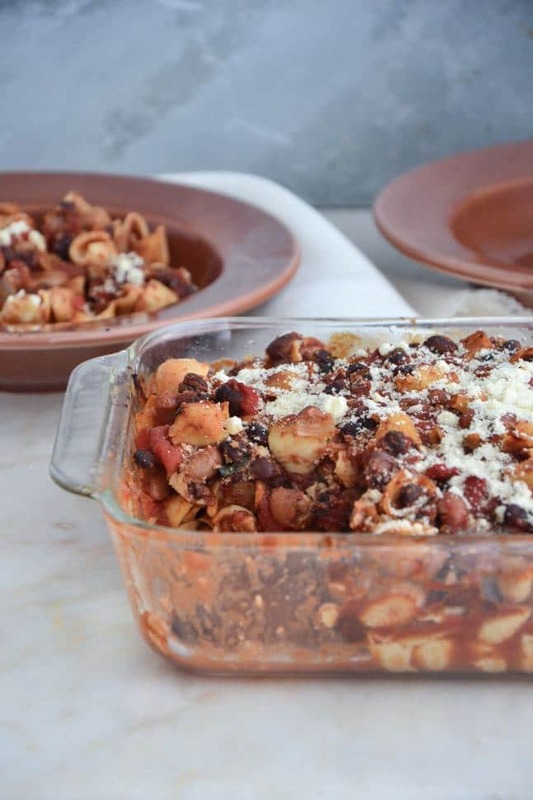 What sounds better than an easy baked chili pasta casserole that’s filled with warm spices and hearty beans? Right now that sounds perfect to us. 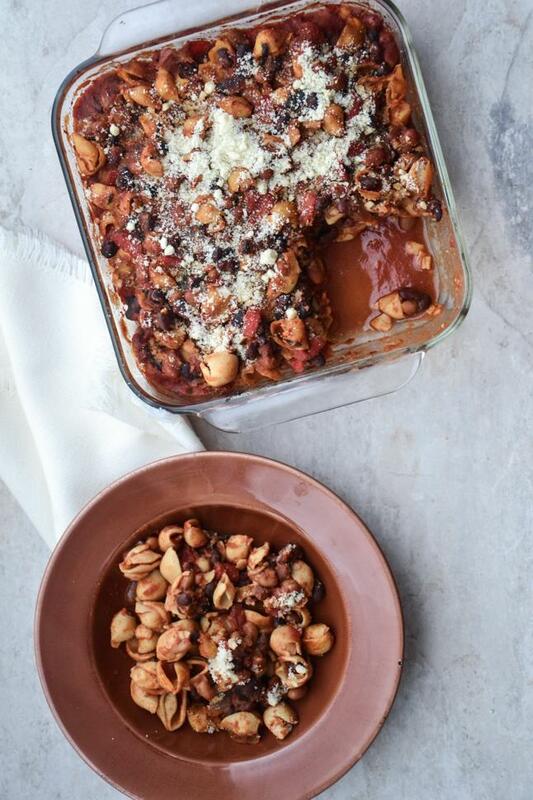 We’re all about bringing you clean comfort foods this winter and this gluten-free and vegetarian casserole is flavorful, filling and so easy to make. Let us show you how to make it for dinner tonight in a few easy steps! It’s time to get cozy, folks. We’re kicking things up a notch and making you some cozy comfort foods that are clean and easy. Just the way you like them. We’ve heard from so many of you that you’re in need of new weeknight meals so this is the perfect kick-off recipe for you to enjoy any night of the week. This baked pasta casserole is ideal for busy mom’s who are feeding hungry kids and it’s equally perfect for a weekend potluck with friends. However you enjoy it, don’t forget to add the almond flour on top because it acts like a ‘parmesan cheese’ topping and adds the perfect touch to round out the meal. 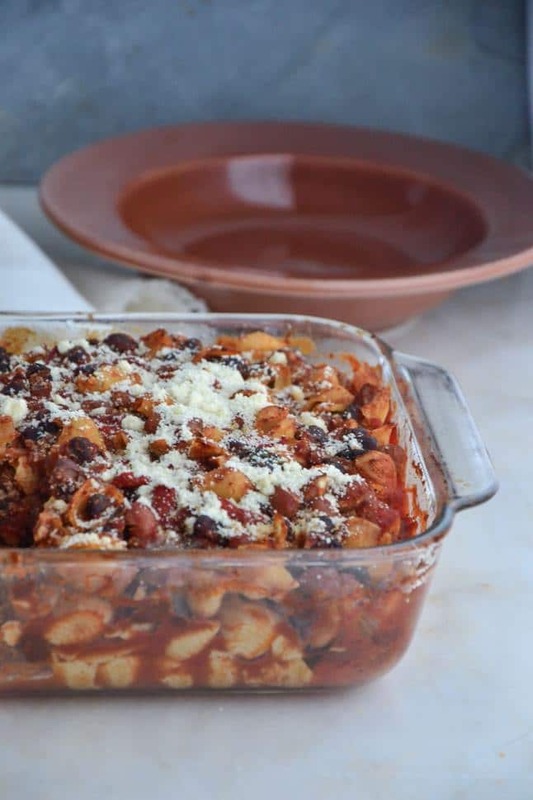 Here’s how we made this Baked Chili Pasta Casserole in three simple steps. When you’re food shopping, try to buy organic ingredients. Here are The Benefits of Eating Organic. STEP 1 // Cook the chickpea pasta in a small saucepan with water + saute the veggies in a large skillet. STEP 2 // Combine the pasta + veggies in a baking dish + bake until tender. Sprinkle almond flour on top in the last 10-15 minutes of baking. STEP 3 // Serve warm. SERVING SUGGESTION // We made this recipe on a cold winter night + it hit the SPOT! We served it with a side of roasted vegetables drizzled with olive oil, sea salt + pepper and it was just enough to keep us satisfied. The topping looks like cheese but it’s not! It’s almond flour so make sure you use that as the topping for delicious flavor and a boost of protein in every bite. Serve leftovers cold, room temperature or heated up on the stovetop the next day for an easy lunch. This is a recipe you’ll be coming back to again and again because it’s so versatile. OUR GLUTEN-FREE PASTA CHOICE // Our favorite gluten-free pasta to use in this recipe is Banza because it’s made from chickpeas and not rice or other yeasty flours (link below to check out the ingredients) so it’s filled with protein, which is ideal for any of you focusing on liver detoxification because your liver needs protein in order to remove toxins + keep you healthy. ORGANIC CHICKEN OPTION // You can easily add organic chicken to this recipe. 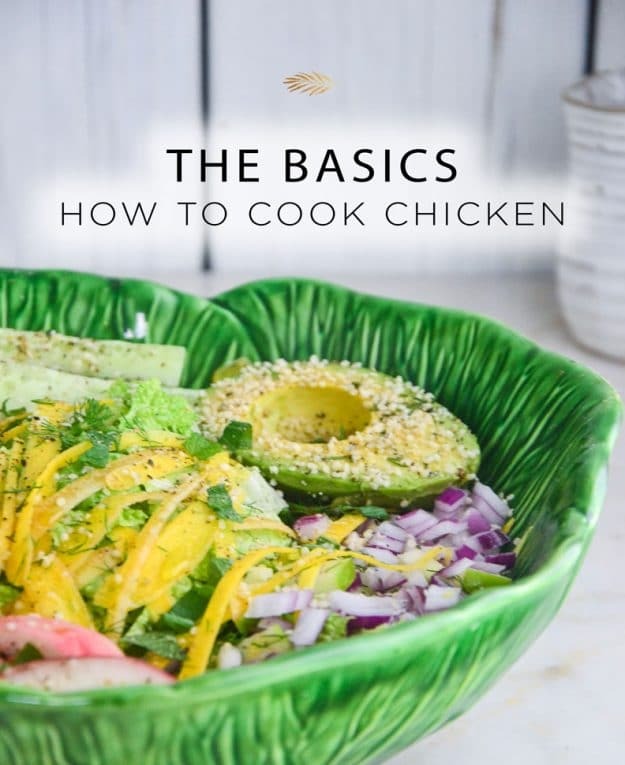 Check out my favorite ways to cook organic chicken in my recent feature in our column, The Basics). You can easily roast chicken and then cut it into cubes and add it to this finished casserole before serving or you can poach chicken and shred it with a fork and add it to this recipe before serving. Both ways to cook the chicken are in our NEW column, The Basics. STILL HUNGRY? 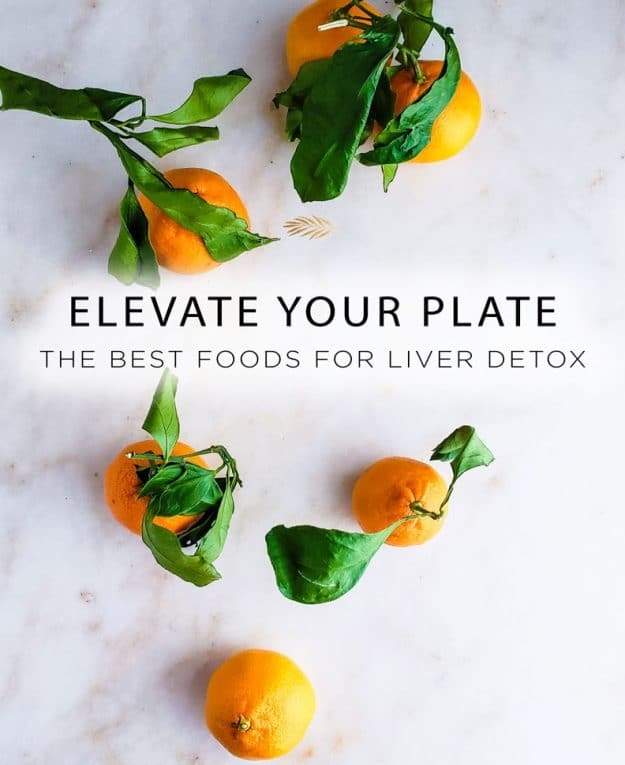 For more of our anti-inflammatory recipes, check out our 3 Month Anti-Inflammatory Meal Plan, which is only available for a limited time through February. 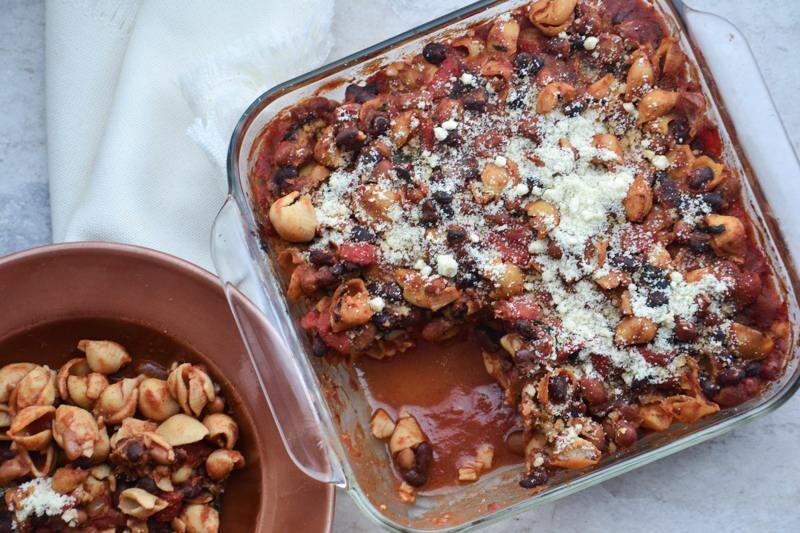 This baked chili pasta casserole is full of warming spices and hearty beans. It is gluten free and vegetarian. Grease 7x10 inch baking dish with coconut oil. Cook pasta according to package instructions, drain, rinse with cold water and set aside. In large fry pan, add olive oil, onions, and green peppers, cook for 5 to 6 minutes or until they are soft. Then add minced garlic and cook for 1 more minute. Now, to the fry pan add chili powder, cumin, sea salt and black pepper, cook for 2 more minutes ( this just wakes up the spices). Next add in the tomato sauce and diced tomatoes, stir well. Lastly add in black beans and pinto beans, simmer chili for another 10-15 minutes so all the flavors mix together. While chili is simmering, mix together in a small bowl topping ingredients, set aside. In prepared baking dish, add cooked pasta and chili, carefully mix well. Then sprinkle topping over the pasta/chili casserole. Bake for 30 minutes or until topping is golden brown and casserole is warmed through. Add the almond flour topping for the last 10-15 minutes of baking. Serve and enjoy. Note: You can also freeze the leftovers and keep in freezer for up to one month.